Please click here for the new options form. The most important measurement is the shoulder as we can't modify that significantly, unlike all other measurements. So it's best if you can measure a jacket that fits you well from shoulder seam to shoulder seam and compare with the below measurement chart. The slimmer fit trousers are slightly slimmer. Full canvas construction. The most important aspect of the jacket. 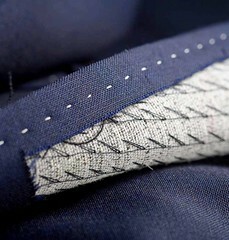 We use a horsehair canvas interlining in the chest and lapels. The canvas is hand-sewn so that it floats separately from the fabric and the lining, resulting in better drape, lighter weight, and allows the canvas to conform to your body. Cheaper suits use a fused construction which glues the layers together, making the jacket stiff, heavy, and less breathable. Typically, due to the complexity and amount of handwork required, only suits that retail for more than $2000 will have full canvas construction. Read more about full canvas construction on Put This On. 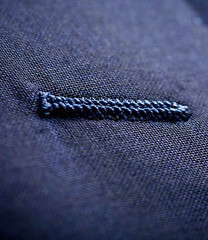 Basted lapels. 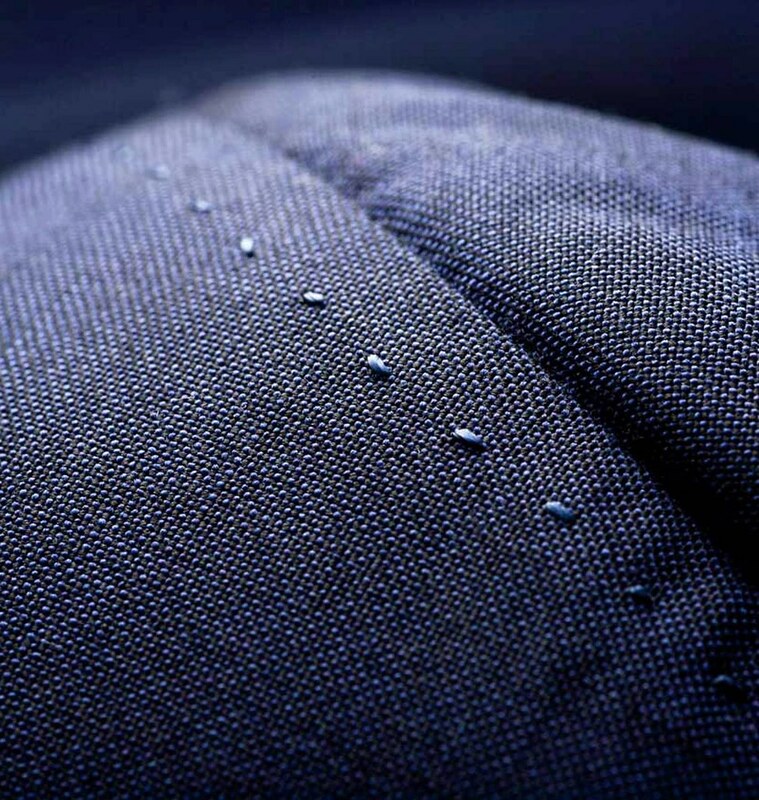 By attaching the canvas to the lapel with a degree of tension, the lapel rolls naturally, giving a three-dimensional appearance to the front of the jacket. This can only be achieved by hand-sewing. Hand-set collar. Allows the felt to be evenly distributed, for a better fit. 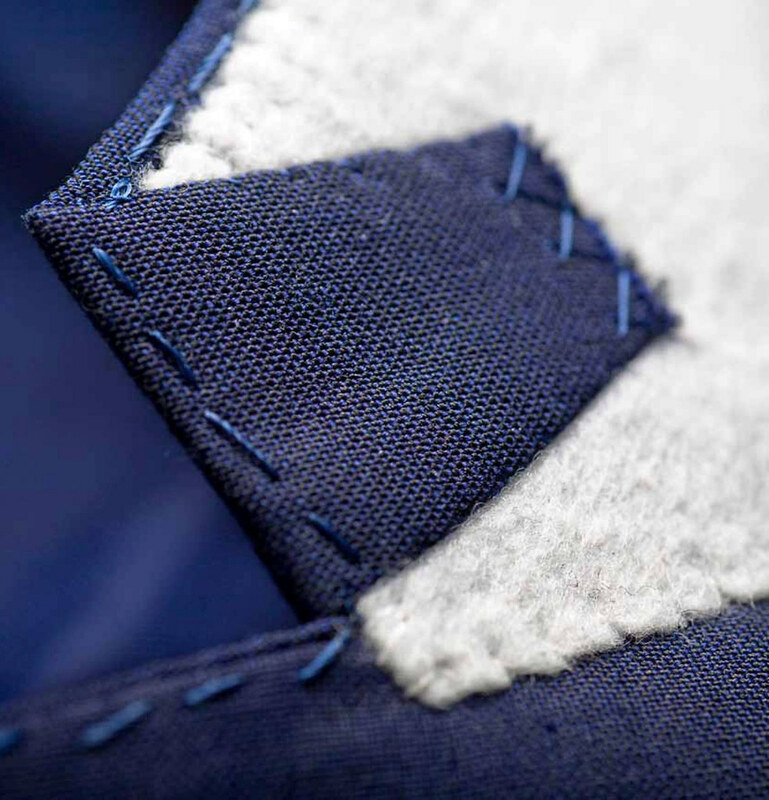 Hand-sewn pick-stitching. On lapels, shoulders, and throughout. Handmade buttonholes. 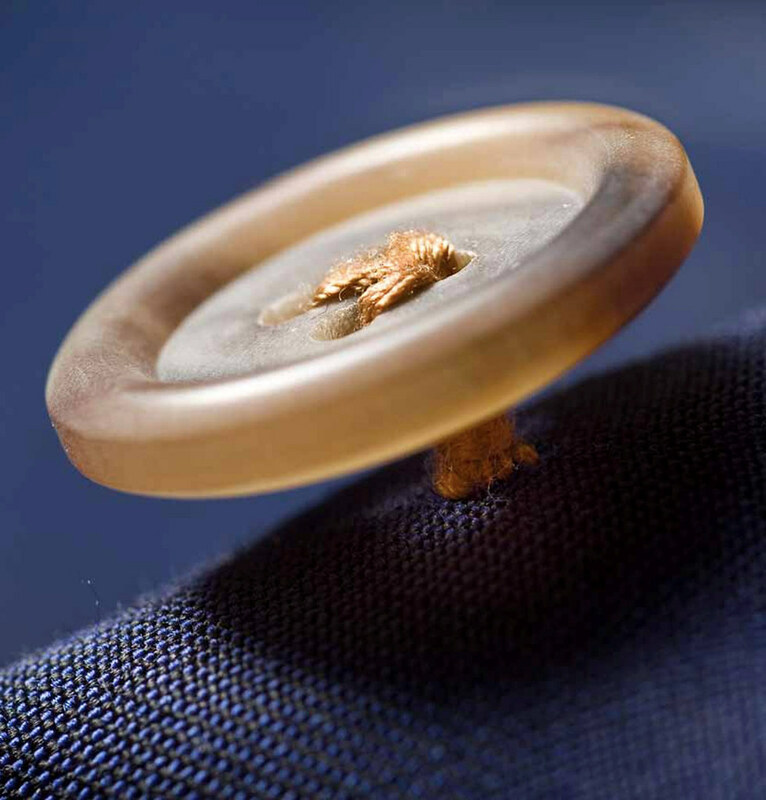 Including working sleeve buttons. Horn buttons. Attached with a crow's foot stitch, which can only be made by hand. Flower loop. 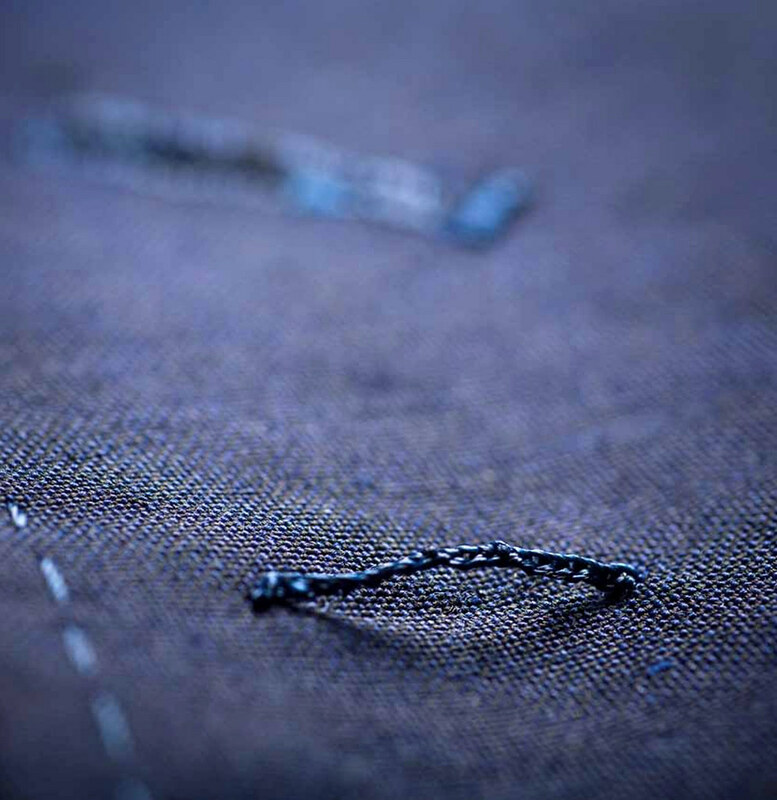 Attached by hand to the back of the left lapel, this keeps flowers worn in the lapel secure. Split waistband. 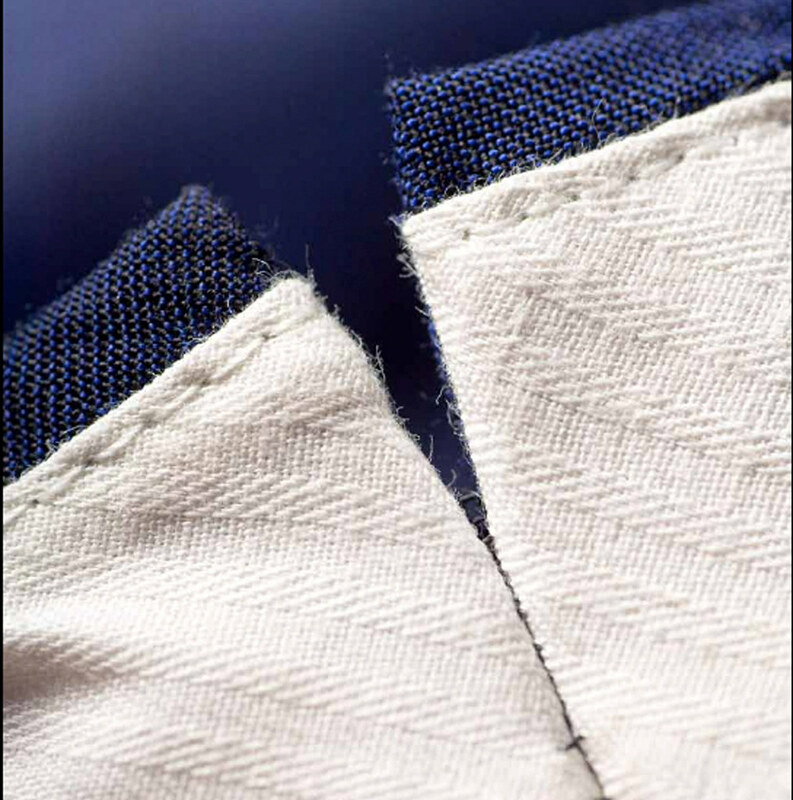 Allows the waistband to adjust comfortably as your waistline fluctuates throughout the day. Pleated curtained waistband. 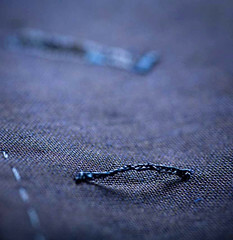 Protects the internal structure of the trousers, and allows the pockets to lay flat. 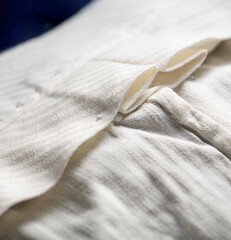 Pleats give the waistband room to adjust. Clean belt loops. Attached with a slip stitch so that no stitching is visible on the outside of the belt loops. Hidden pocket located below the waistband. 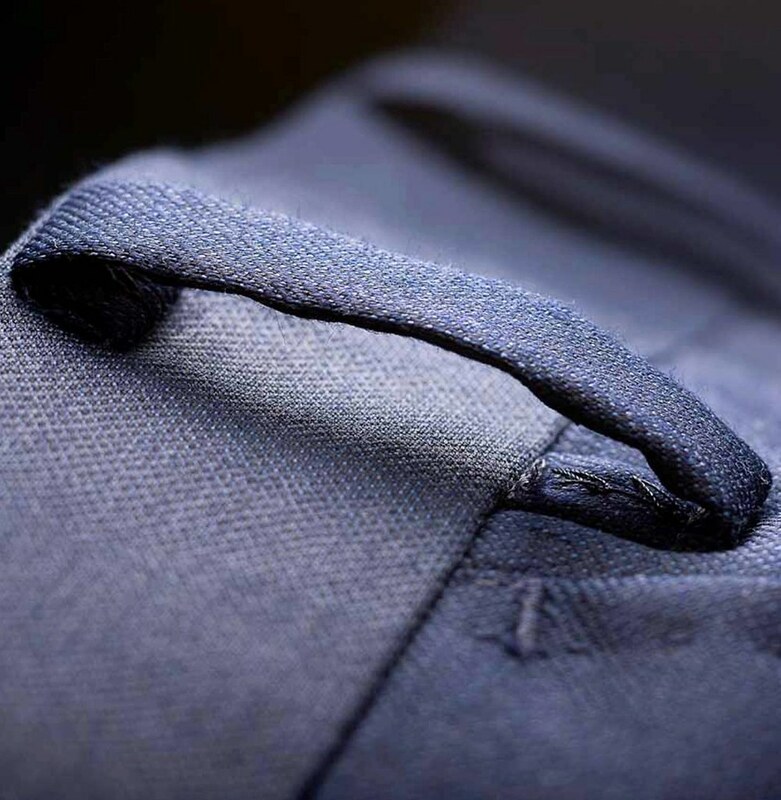 There is an additional coin pocket in the more traditional location inside the right front pocket. 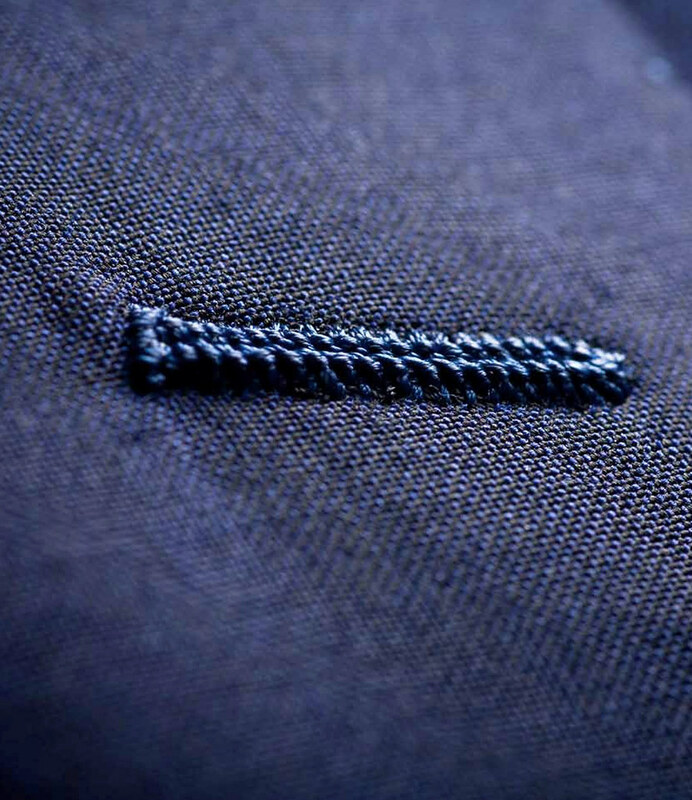 We can make custom suits based on your measurements. The price is the same as the ready-to-wear suits and will take about 4-6 weeks. Unlike other custom tailors, we prefer to first send you one of our ready-to-wear suits for you to try on, and then you can note measurement modifications based on that (e.g. +1" waist, -0.5" sleeve, etc.). 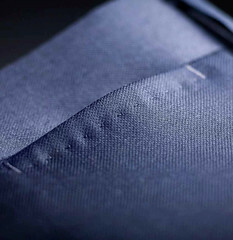 This allows us to have a very good chance of making your first suit fit perfectly. 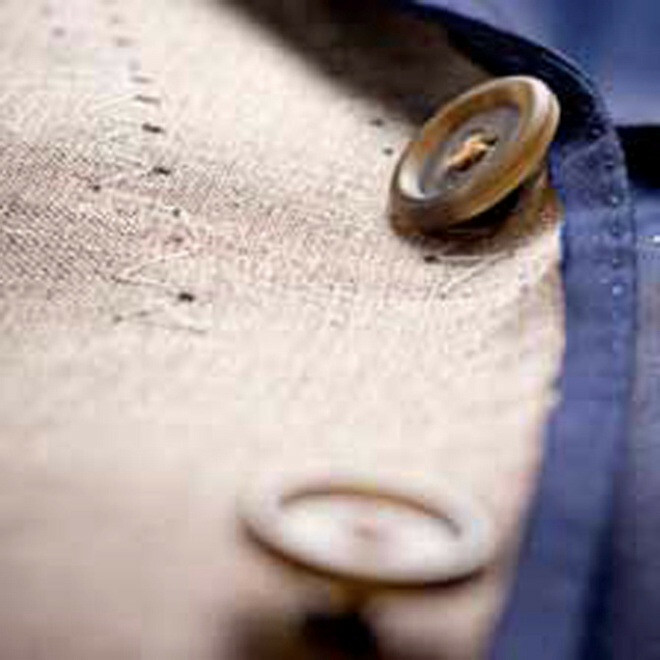 Whereas the more common method of simply submitting a set of measurements typically results in ill-fitting, unwearable suits for the first one or two iterations, and is a waste of your time and money. To get started, take a look at the above measurements and order the trial suit in the size that will fit you best. If it just happens to be perfect, then keep the suit. If not, return it and we'll make you a new suit with your desired modifications. When you receive the suit, send us photos and we'll work out what measurements need to be changed. No expertise required. If you wish to skip the trial suit and have the custom suit made directly, we don't recommend it but can do so. 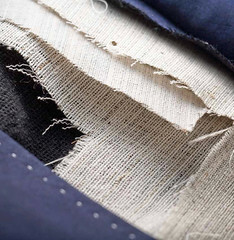 See our current list of fabrics here. Most conservative fabrics are in the A price range, including the ready-to-wear charcoal suit. Name brand mills such as VBC, Gladson, Ariston, Loro Piana, Zegna start at price range C.